A to Z Puzzles are a great puzzle for testing your knowledge of the English language, and also a test of logic and your ability to keep track of which letters you have already used and therefore solve the puzzle through elimination. 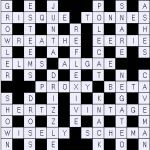 The aim of the puzzle is simple: to complete the crossword grid you are given by placing each of the letters from A - Z exactly once into the 26 empty squares, thus completing a valid crossword grid. The A - Z crossword variant puzzle can be supplied with a range of different options, for instance UK English or American English, and can be at a variety of different grid sizes too: just let us know what you require. All A to Z Puzzles are provided in PDF format, for ease of use and easy publishing. The puzzles also include a check-off list of letters from A - Z so that it is easy to keep track of which letters have or haven't been used whilst solving the puzzles. Please click to view a sample A to Z Puzzle online. Publishers - Please contact us to buy A - Z Puzzles puzzles for publication in your book, magazine, newspaper, any other printed media or online.